Although not a actual virtualization topic, I think it's something a lot of Admin's have to deal with every now and then. For me it's occasionally when working with templates of Windows server based VM's, when they are created a long time ago some Admin's just tend to forget what local administrator password was used. Because it is usually changed after a VM has been deployed to a different password. When you then need to work on such a template for some reason you will get stuck when you do not remember the password. In the past I used the "Offline NT Password & Registry Editor" to reset the administrator password, but recently a Admin at a customer informed me there was a other way to reset the password and this way would also work on Windows server 2012. 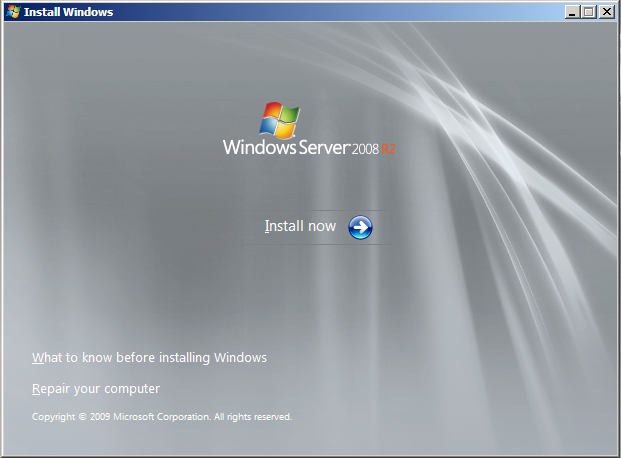 You need to have the Windows server install dvd, or if you're like me into virtualization a ISO of that dvd. For both Windows server versions you need to go to the "Repair your computer" option on the Setup menu after booting the VM (if it's a template, first convert to VM) from this dvd. After reboot the server (not from dvd!). At the logon screen press Windows-key + U this will open a command prompt. Now run the following command "net user administrator Password" where password stands for you the password of your choice. After closing the command prompt you will be able to login to the server as local administrator with the password you previously entered. You're able to logon again but you are not completely done yet, there is some clean-up to be done. Again boot your VM from the Windows server dvd and follow the previous mentioned steps to get to the Command Prompt and go to the disk that holds the system32 folder. When finished close the Command prompt and click "Continue" now you're VM should be running as it should and you should be able to logon as local administrator. If it was a template do not forget to convert your VM back to a template. And store the local administrator password in some sort of password-vault ! How to manage Hardware Version 10 VM's on a standalone (free) ESXi ? As you might already know, to manage or configure VM's at hardware level 10 which comes with ESXi 5.5 and vSphere 5.5 you will need the vSphere web client (and vCenter) to do so. So what about a standalone or free ESXi 5.5 host ? The easiest way is NOT to upgrade the hardware version to version 10, but to simply keep it at any version below by this way you can fully manage and configure the VM with the C# client (full vSphere client). I got caught by my enthusiasm to try the new features of vSphere 5.5 and I went and upgraded a VM to version 10 in a lab environment not connected to a vCenter. The quickest way I found to get out of this "unmanaged" situation was to create a new VM with hardware version 9 without disks, after creation I moved the disks of the unmanageable version 10 VM to this new VM and powered it on. This will give you back control, but you still won't have any of the new features of 5.5. I have been looking into getting VCAP5-DCA and VCAP5-DCD certified for some time now, when I was making plans to attend VMworld 2013 in Barcelona those 2 came together. I was lucky enough to have the opportunity to get some study time beside my work for a couple of weeks just before VMworld. For the DCA exam I thought I did not have to study that much, so I just did some fleshing up on my vMA "skills" (don't use it regularly) and on configuring SATP rules by CLI. On the other hand I did study a fair amount on the DCD exam as I knew it would be a real challenge. I planned my DCA exam on Monday (Partner / TAM day) in the afternoon, because in the morning I was still travelling to Barcelona. And I planned my DCD exam on Tuesday morning, to be sure I could spend the rest of my time at VMworld attending sessions (and going to the various parties). When I sat for my DCA exam I found it a very good exam, I would almost say I enjoyed taking it. I think that for enterprise admin's it is the same as it is within your comfort zone. Nevertheless it is a challenging exam where you are really tested for your hands-on knowledge. I did manage to complete all questions / tasks within the given time. I knew that I would not receive the results immediately after completing the last question it could take up to 15 days before you got the results back by email. But to my surprise VMware has recently changed this and they will get you the results within 8 hours ! As I did not know this I was surprised to find a email "Notice of VMware Technical Certification" the next morning and the best part I passed ! That day started very good, and with a boost in confidence I sat for my DCD exam. Now this is a whole different kind of exam, I didn't like it as much as the DCA exam for mainly 2 reasons. The first is that the design questions you get you need to do in a environment somewhat similar to MS Visio, but is feels like it is in Beta. It just isn't user friendly especially if you need to make modifications along the way, I was struggling more with the user interface as I was with the actual content of the question itself. And the second reason for me is that a lot of questions have vague descriptions, I understand that when you are designing in real life there will also be points that are not really clear or vague but in this case you could ask to get clarification. This is not a option during the exam of course. I have to say that the DCD exam is a difficult exam, in which time is your biggest enemy. It's just a huge amount of questions that you need to answer and the questions do cover every object in the blueprint ! When I got to the last question I had 5 minutes left, luckily I was able to answer within a blink of an eye. After answering the last question I had some exciting seconds before the results where shown, I passed this exam as well. Needless to say that this has been the best VMworld ever for me ! Both exams are difficult and need some sort of exam strategy if you ask me, but both strategies are very different. If you are pursuing either or both of them, please take a look at my VCAP5-DCA and VCAP5-DCD study pages for useful links and tips. A couple of days ago I wrote about changing the scratch location on ESXi hosts in relation to the use of SNMP "Enabling SNMP on ESXI 5.1 host results in "The ramdisk 'root' is full" events". In addition to this, the same customer ran into a other issue which also relates back to having the scratch location on non-persistent storage. For hardware maintenance hosts where put into maintenance mode and "handed over" to datacenter engineers, they needed to update firmwares and bios of these hosts. When they finished the first host, they powered it on and it booted up ESXi as normal. When they came up to find out if all was OK with this host, the VM admin looked up the host and found it in fully operational state ! And not in maintenance mode as expected, when looking at the host tasks and events it looked like "system" had taken the host out of maintenance mode after it came back online in vCenter. This could cause some serious issues, if the host is a member of a Cluster with HA and DRS (full automated) enabled but lacks the network uplinks that provide the VMnetwork(s). VM's would be vMotioned to this hosts, these VM's will lose their network connection ! For this to happen, the host has to be in operational state before it re-connected to vCenter. So why did this host "forget" it was in maintenance mode during the hardware maintenance ? When I saw this happening I remembered that in the past with patching ESXi 4.1 hosts similar events happened and this was caused by that during the patching the scratch location (/tmp/scratch) got damaged / not accessible. When this happened the host booted normally, re-connected again to vCenter and got taken out of maintenance mode by the system account. So a quick check learned that the host we where working on now had it's scratch location on non-persistent storage, next I checked in what way the datacenter engineers shutdown or reboot a ESXi host. I learned that as they don't have the rights to do shutdown or reboot a host through the vSphere client (either connected directly to the host or connected to vCenter), they used the out-of-band management (iLO, Drac, iRMC etc.). They always tried to do a graceful shutdown or reboot, but for this agents need to be installed on the host. As this is not the case this does not work for them, the other option is hard reset or power cycle. Let's be clear this is not a good thing, in my opinion you always need to do a clean and graceful shutdown or reboot ! Especially if the host concerned has its scratch location on non-persistent storage (read ramdisk), as this type of storage will act like if the host is experiencing power failure. And therefore not writing anything to a persistent location as it would during a clean reboot or shutdown. Recently I ran into a issue when doing some work on a ESXI 5.1 Cluster, I needed to put the hosts in maintenance mode one by one. When I put the first host in maintenance I assumed that the host would be evacuated by migrating all VM's with the use of vMotion as Enterprise plus licenses where in place. But when the progress bar hit 13% the vMotion process stopped with a error. The error referred to "ramdisk (root) is full". When I checked with the customer they told me that this started happening after they configured snmp. They found that it would for some reason fill up the disk containing /var and they also found that sometimes those hosts became unresponsive to SSH and or DCUI. After looking up the error message it quickly became clear what the relation was between snmp and "ramdisk (root) is full", the snmp service generated a .TRP file for every snmp trap sent. I believe this is not normal behavior, when I checked the functionality of snmp "esxcli system snmp test" it reported a error "Agent not responding, connect uds socket(/var/run/snmp.ctl) failed 2, err= No such file or directory" this proved my assumption was right (a successful test should result in "Comments: There is 1 target configured, send warmStart requested, test completed normally.". These files are stored in /var/spool/snmp and this location was located on non-persistent storage, in fact it was located on a 4GB ramdisk. Please check VMware KB2042772 for details on the error related to scratch location. The snmp service will write a maximum of 8191 .TRP files, if the /var/spool/snmp location runs out of space before hitting this number you will have a host which is no longer able to vMotion, it can also become disconnected / unresponsive. And in some cases you are not able to start DCUI as there are no free inodes on the host. In this case connect to the host console (iLO, DRAC,....) and make sure you can login, then stop the vpxa service this will free up a inode and you will be able to start DCUI from the host's console (Troubleshooting options). Now you need to remove the files that fill up the ramdisk, but first be sure that snmp is the cause of the issue by checking the file count in /var/spool/snmp "ls /var/spool/snmp | wc -l" if the result is above 2000 files snmp is most likely the cause. To remove the files you can go 2 ways, move to the /var/spool/snmp dir and remove all .TRP files "for i in $(ls | grep trp); do rm -f $i; done" but I also found that stopping the snmp service "esxcli system snmp -e No" also clears the dir most of the times. When the files are removed the host will start responding normally again, you will be able to start the vpxa service again "/etc/init.d/vpxa start" if you had to stop it previously. The permanently fix this issue you need, as stated earlier to change to scratch location preferably to a local or shared datastore (VMFS or NFS). You can do this by editing the advanced settings (software) of the host “ScratchConfig -> ScratchConfig.ConfiguredLocation” after changing a reboot is mandatory to apply the change. If you have to go thru a number of hosts , you might want to do this by using PowerCLI. If your lucky and the naming convention of the (local) datastores is uniform you will be able to automate all actions. If not (like in my particular case) you either go it host by host with the use of the vSphere (web) client. Or you could use a small script to look up all datastores, let you select the (local) datastore and update the advanced settings for you. sample script below. When you or your company is replacing their existing SAN on which their vSphere and/or vCloud environment is running, you are probably going to replace it with a VAAI capable storage solution. VAAI (vStorage APIs for Array Integration) was introduced with ESX(i) 4.1 and it basically provides a way to offload storage related tasks to the storage device. This reduces the load on the ESX(i) hosts and vCenter, it also speeds up those tasks. When looking at vCloud Director, it is since version 5.1 also supporting VAAI, it is possible to offload any cloning of VM's "Fast Provisoning" as it is called in vCloud. This speeds up the deployment of vApps considerably, it also helps to be very storage efficient when combined with deduplication and thin provisioning. So far still no downside, well the point is that when you need to move vApps to a datastore that is on a different storage system or you need to move your entire vCloud environment to a new storage solution then that is the moment you could run into some unpleasant suprises (limitations) that VAAI brings. A customer where I was recently working on their vSphere / vCloud environment where running both these environments on the same storage solution, but due to the explosive growth of the vCloud part they where starting to experience performance issues. The storage solution could not deliver the needed IOPS. Their current storage solution is a Netapp VAAI capable one, the purchased a new storage solution which would be only used for their vCloud environment. This also is a Netapp VAAI capable one, only a more high performance model. They had enabled "Fast Provisioning" within vCloud from the get go, so all vApps where deployed like this. This means all linked clones where actually "Flex clones". When the new high performance storage solution was setup and ready to be used they needed to move / migrate their deployed vApps to the new datastores. They knew that this would cause the linked clones to be consolidated and become full clones as this is the only way a SvMotion could move the VM's within the vApps. But a unexpected error stopped this, vSphere vCenter reported a error explaining that it could not consolidate and therefore not migrate the VM's. When I had a look at it I first thought the error could be caused by a compatibility mismatch between vSphere and Netapp Ontap, so to gather more info on this I opened up a support case with VMWare GSS. After providing vCloud logs and some additional information the SR became a PR and went to the engineering department, quickly after this had happened I got a answer from VMWare, which basically said that we where trying to do something that is not supported. Not the answer I was looking for ! And when I continued to read thru the list of unsupported actions regarding vCloud and VAAI storage I even became more unhappy no consolidate or Storage vMotion are permitted on VAAI enabled storage (Fast Provisioned VM's and vApps that is). Luckily at the bottom of the email it read that it move could be done by the use of the "relocate" methode which is not present in any UI but only thru the vCD API. So there was a way of accomplishing the move, but it would take me some time to figure out how to do this. The mail provided a link to vCloud 5.1 API guide. Consolidate operations are not permitted for VMs created through the VAAI cloning process, even for powered-off VMs. Reporting on capacity remaining on a given datastore may be inaccurate. Source VMs, when cloned, have a REDO log attached to them, which, if they are running, may cause a negative read performance (compared to non-cloned vm) impact. No explicit way to prevent an admin from turning on Vaai flag for NAS datastores that do not support Vaai. Vaai clones will not work for vSphere < 5.0 (Linked clones in VCD only work for VC versions after 5.0). Relocate of vaai clones (VMs residing on vaai enabled volumes) will not work if the vm has user created snapshot. The snapshots will need to be removed for clones to work. There maybe additional constraints on Vaai Clone support imposed by arrays. Please contact vendors. On page 18 of the guide you find the information about authentication and headers required and on page 231 there is information on relocating a VM to a different datastore, example code is provided. With this new information I started to figure out what this relocate actually does, when I was looking for some additional information I stumbled upon the blog of Matt Vogt he wrote a article on VMware opening up a lot of API's with the 5.1 release of vCloud Director, but there was still a lot more to be desired. One of the things being able to change the storage profile of VM's and for this you need to know the Href for the storage profile you want to change to. When you change the storage profile of a VM in vCloud it will trigger a relocate action, because the different storage profile refers to a different datastore. Matt used a script from Jake Robinson posted on the VMware Community which could retrieve the Href of storage profiles and created his own script which could change storage profiles of all VM's within a vApp. I took his script and adjusted it to my needs, this resulted in a script which can do the following. It can change the storage profile of VM's within the same vApp in one go (sequentially). When the VM has a chain length lower then 2 it can be powered on, when the chain length is equal or greater then 2 the VM needs to be powered off to successfully complete the change. In any case the linked clone will be consolidated to a full/thick clone, so it becomes independent of it's base disk(s). When I tried the script it did not work for some reason it would not retrieve the Href of the new storage profile. For my purpose I did not spend any time on solving this I just hard coded the Href in the script, be sure to retrieve it yourself and update the script before use. This can be done easily with a Powercli one-liner. Manually change the storage profile of a VM to the new storage profile, this VM will be relocated to the corresponding datastore(s). This is the Href of the storage profile, update this in the script at $profileHref line and you are ready to relocate vApp's. Of course you can also use the script when relocating traditional/vSphere linked clones. vSphere 5 introduced a new feature to clean up VM snapshot "left-overs" which could be the result of a snapshot removal action where the consolidation step has gone bad. This would result in the snapshot manager interface telling you there are no more snapshots present, but at datastore level they still exist and could even be still in use / still be growing. This could case all kinds of problems, first of all VM performance issues as the VM is still running in snapshot mode, secondly you are not able to alter the virtual disks of this VM and in the long run your could potentiality run out of space on your datastore because the snapshot keeps on growing. Prior to vSphere 5 there was a possibility to fix such a situation thru the CLI, now with vSphere 5 you get a extra option in the VM - Snapshot menu called "Consolidate" this feature should clean up any discrepancies between the Snapshot Manager interface and the actual situation at datastore level. I'm always a little reluctant when I'm at a customer and they use a lot of snapshotting, it is a very helpful and useful tool but you have to use it with caution otherwise it could cause big problems. Usually the problems start if snapshots are kept for a longer period of time or if the snapshot a layered onto each other, but even if you are aware of the problems it can cause when it's used wrongly it can still happen that you run into issues when using snapshots. That being said and when we look at features offered by the various Vendors of storage devices, I'm pointing to the VM backup solutions that they offer. When a VM is running when being backed-up they all use the vSphere snapshot (with or without the Quiescing of the guest file system option). Basically if your company uses a SAN that leverages this functionality and it's configured to backup your VM's on a daily basis you have a environment that uses snapshotting a lot (on a daily basis) and therefore you could possibly run into more snapshot / consolidation issues then when you would not have a SAN with this functionality (nobody snapshots all it's VM's manually on a daily basis, I hope). When I recently was at a large customer (+2000 VM's) that uses their storage device feature to backup complete datastores daily and also uses vSphere snapshots to get a consistent backup of running VM's. For some reason they run into snapshot / consolidation issues pretty often and they explained to me that the Consolidate feature did work ok on VM with a Linux guest OS , but they almost always had a problem when trying to consolidate on a VM with a Windows guest OS it would simply fail with a error. So I had a look at one of their VM's that could not consolidate although the vCenter client was telling it did need it. When a VM is in this state and it is still operational there is a issue, but the uptime is not directly affected, but most of the time the VM will be down and it will not power on again because of the issue. It will simply report a error of missing a snapshot on which the disk is depending. The way I solved it at this customer (multiple times) is by editing the VM's configuration file .vmx and re-registering the VM to vCenter and after manually cleanup the remaining snapshot files. Please note that if the VM was running in snapshot mode all changes written in the snapshot will be lost using this procedure, in other words the VM will return to it's "pre snapshot" situation. For this particular customer this was not a issue, because the failed snapshots where initiated for backup purposes so no changes where made to the VM when it ran in snapshot mode. So if you run into this issue and you know that their where no changes made to the VM or the losing the changes is a acceptable loss you could solve it by these steps. Download the .vmx and open it with a text editor (I prefer Notepad++ for this kind of work) find the line that has the virtual disk files configured scsi0:0.fileName = "virtual-machine-000001.vmdk" and remove "-000001" so you are left with scsi0:0.fileName = "virtual-machine.vmdk" save the file. Rename the .vmx file on the datastore to .old and upload the edited .vmx file. Either reload the VM by using PowerCLI** or remove the VM from the Inventory and re-add it again. If you get the "Virtual Disk Consolidation needed" message, go to the Snapshot menu and click "Consolidate" it should run correctly now and remove the message. New Fling from VMwareLABS called "VisualEsxtop"
Most of the Fling's coming from VMwareLABS are worth trying and every once in a while there is a Fling that is really cool and above all useful (like InventorySnapshot I wrote a post on a while back), just a couple of days ago some of the engineers from the VMware performance group release VisualEsxtop. The name says it all, it is a graphical version of esxtop which can be run on Microsoft OS, Linux OS and on Mac OS** so it is really "cross-platform". It works remotely and can be run on any computer which has network access to ESX(i) host or vCenter (although I haven't been able to connect it to a vCenter successfully). It will color coat important counters and issues automatically. Further more it has the ability to record and playback batch output, it can create line charts for selected counters and it has counter descriptions when you "mouse-over" them. Sometimes you will run into a VM that is unresponsive and or unreachable by RDP, even the vSphere client console will not work. The only way to solve this is to shutdown the VM, in some occasions even this will not work nor will the power-off or reset commands work. When this is the case you will be getting error messages like: The operation is not allowed in current state or The attempted operation cannot be performed in the current state (Powered Off) or anything else along this line. Recently a was working at a customer and the had a similar situation with 2 VMs, the admin's working on it where not able to successfully shutdown the either of the VMs. They asked if I knew a way to do it, maybe from the CLI. I knew I could kill the process of these VMs thru CLI with the command esxcli vm process list to get the world-id followed by esxcli vm process kill -t [soft,hard,force] -w WorldNumber to kill the process running the VM. But for some reason I was not able to find the VMs concerning in the output presented in the CLI (perhaps to many VMs on the host and over-looked it). As alternative I also knew there was a way to kill processes from esxtop (only available on ESXi 4.x and 5.x), but I did not have all the details on the steps to perform but this was quickly solved by a quick search thru the VMware KB. As it turned out, I think I prefer the "esxtop way" above the other ways of doing it, for 2 reasons; first esxtop is something you use regularly (I assume) and second it is a very clear and "visible" way. On the ESXi console, enter Tech Support mode or connect thru SSH and log in as root. Press Shift+v to limit / filter the view to virtual machines. At the World to kill prompt, type in the Leader World ID from step 7 and press Enter. *Note; for the one's running ESX instead of ESXi please refer to VMware KB1004340 as there a different ways to do this on these systems. Last week during a change on one of the core switches of the NFS storage network at a customer, we ran into a big problem causing a outage of 50 % of all VM's for around 4 hours. The problem started with a network related error, on which I will not elaborate other then the result was a unstable NFS network causing random disconnected NFS datastores on the majority of the customers' ESXi hosts. On top of that it also caused latencies, which triggered vMotion actions causing to ramp-up the latencies even more and resulting in a storm of failing vMotions. In theory this would never have happend as the NFS network of the customer is completely redundant, but in real life it turned out completely different in this particular case. After putting DRS into "partially automated" the vMotion storm stopped, the latency continued on the NFS network and this also had it's effect on the responsiveness of the ESXi hosts. 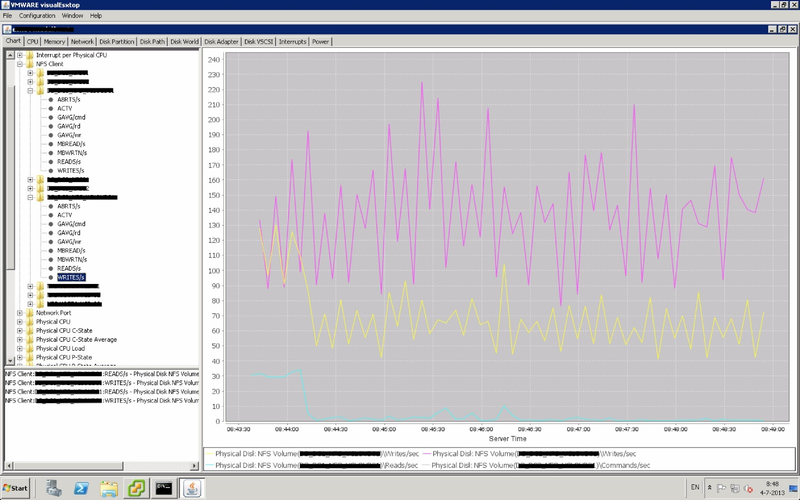 Only after powering down the core switch (the one which had the change) all returned to normal status, datastores were connected to ESXi hosts again and latency disappeared. 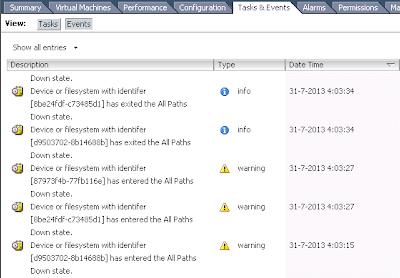 When looking into the vSphere client I found lots and lots of VMs that had a inaccesible or invalid status. When trying to power-on such a VM it would not work and you would get a "action not allowed in this state" message. The only way I knew to get them accessible again at the time was to unregister the VMs from vCenter (Remove from Inventory) and add them again to browsing to the .vmx file with the Datastore Browser and selecting "Add to Inventory". This was time consuming and tedious work, but the only quick fix in getting those VMs back into vCenter. 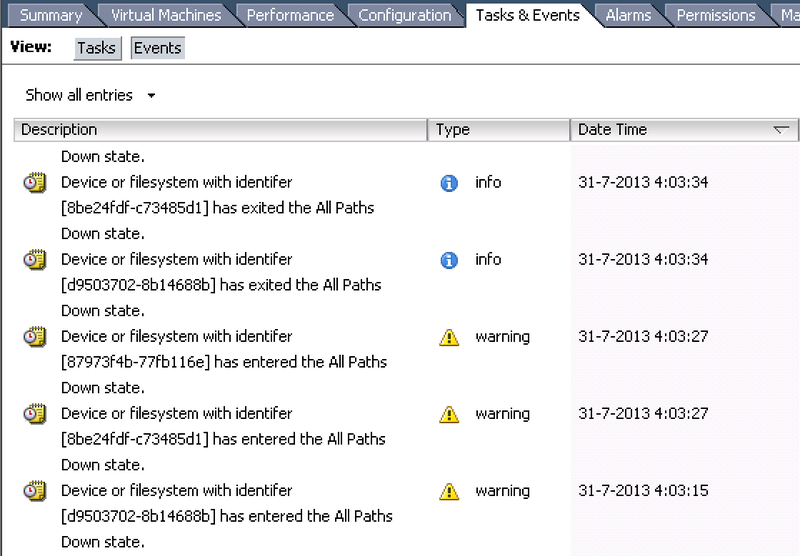 Mind you, most of the VMs where still up-and-running but in no way manageable thru vCenter. 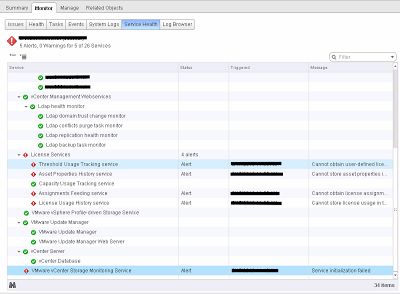 By the time I had all VMs registered again, some also needed a reboot as their OS crashed thru to high disk latencies. I was contacted by the vCloud admin, he had also lost around 100 VMs from his vCloud environment. It looked to be a other long task of getting those VMs back, but we faced a extra problem. vCloud relies heavily on MoRef Id's for identification of VMs, in other words if the MoRef Id changes vCloud will no longer recognise this VM as it cannot match it to anything in its database. But removing a VM from Inventory and re-adding it changes / updates its MoRef Id, so even if we wanted this quick fix I had could not be used on the VMs in vCloud. Luckily the vCloud admin found VMware kb1026043 it looked like VMware had the solution to our problem, but for some reason this solution was not working for us and it needed to have the host of the affected VMs in maintenance mode. It did help us with the search for a working solution, which was quickly after found by the vCloud admin on www.hypervisor.fr a French VMware related blog of Raphael Schitz. He wrote a article "Reload du vmx en Powershell" (Reload a vmx with Powershell) on how to reload VMs into Inventory without having the need for maintenance mode on your host(s), it all comes down to a PowerCLI one-liner that does the trick. You can alter the command to run it against entire Datacenter or just a Cluster. In the end it saved our day by reloading all inaccesible and invalid VMs within just 5 minutes, this is a very useful one-liner as NFS is getting more and more used as preferred storage. The most important database within a vSphere environment is the vCenter database without a doubt. VMware therefore has enclosed detailed instructions on how to setup and configure this database, they have a guide for every supported database type. Recently I ran into a situation which made me believe that VMware "forgot" some details on this database configuration guide, at least when you have your vCenter database running on Oracle. 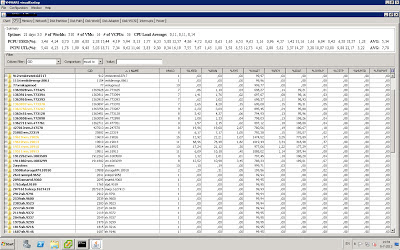 A customer has chosen to put their vCenter database on Oracle as this was their preferred database knowledge wise. And they set it up to also be resilient, the way they achieved this was by having a active and a standby database placed on 2 different database server in separated datacenters. To me it looked like a very solid solution. 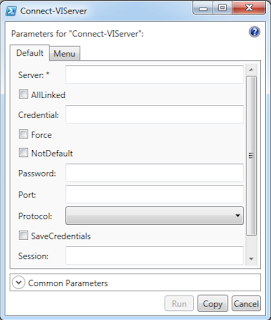 On the vCenter part they modified the TNSNames.ora in such a way it now included 2 database server addresses and also contained the parameters for connect-time failover and load balancing. By doing this they made sure that vCenter could (almost) always connect to one of the two database servers, it would simply do a failover when the connection time would expire. In this case the failover would not have been quick enough to keep vCenter up-and-running but it would need a reboot (or at least a restart of services) to get connection again. But this would not affect the running VMs at all. For maintenance purposes to the database servers, we had to switch from the active server to the backup server. As this was a planned action, we could first gracefully stop the vCenter services and after switch to the standby database server. After the switch all vCenter services were started again and vCenter went up-and-running like it supposed to do. One issue that occurred during this database server switch was that VMware Orchestrator, which was installed on a separate server stopped working, logging all kinds of database related error's. With a quick look at the database configuration of Orchestrator I remembered that it could not cope with multiple database server addresses and was set to connect to the database server that now had become the standby. By changing the database server and starting the Orchestrator services again this problem was solved. When I looked into more detail on what caused this I found VMware vCenter Storage Monitoring Service - Service initalization failed on only thing I found that could link this alert to the database failover was the timestamp, it was recorded right at the same time the failover had happened. Not really knowing where to start investigating on the vCenter server, I first tried to find some information on the VMware KB and the first article that came up described the exact same error message. When reading kb2016472 I quickly found confirmation that this issue was related to the database failover although it refers to vCenter 4.X and 5.0 with the use of a SQL database instead of vCenter 5.1 / Oracle database. It appears that this vCenter Storage Monitoring Service does not use the TNSNames.ora for the database connection, it has it's own configuration / connection file called vcdb.properties. This file has only the first of the two database server addresses. 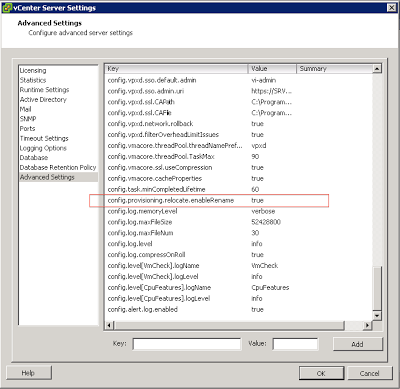 Thru the information in the KB article I knew what to change to get the connection set to the backup database server, and after a restart of the vCenter Server service the vCenter Storage Monitoring Service initialized ok and started without any error. So my conclusion is that even when you have redundancy or failover setup on vCenter database level, there are still some vCenter related products and services that need some manual action to continue to work in case of a (planned) database failover. VMware has published a new Horizon View Optimization Guide for VDI / View Windows 7 and 8 Virtual Machines. This guide contains recommended configuration settings to optimize the OS and provide a overall better scalability and performance in a Horizon View environment. Horizon View 5.2 supports the Windows 8 Metro style user interface and supports the basic touch gestures in a View client running on a Intel Surface tablet. With Windows 8 you can improve the performance by using the new services state change "Manual (Triggered Start)", services are started when triggered the user accesses a component that requires the service to be started. Just a quick post on new products / solutions introduced or going to be introduced. EMC introduced ViPR at EMC World convention last week. Great articles on ViPR you can find on the StorageIO blog by Greg Schultz, he wrote a 3 part series on this new solution of EMC "EMC ViPR virtual physical object and software defined storage (SDS)". A other take on this new solution has been written by Duncan Epping on his blog "EMC ViPR; My take". A question regularly asked, how much resources does my vSphere environment have at the moment. Or more specific, how many VMs can I add to my environment and still make sure that I have enough resources available in case of host(s) failure ? It is a viable question that is often asked, but the answer is not really easy nor straight forward. 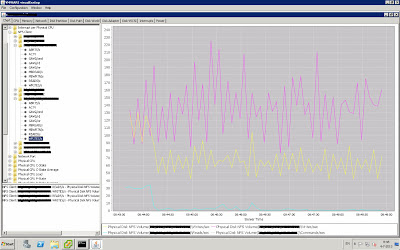 To be clear if you want this kind of realtime information you should be looking at a analyses tool like VMware vCenter Operations or Dell vOPS (formerly vKernel / Quest) these tools can (when you purchase the right licenses) give you the exact amount of VMs you could add to your environment while retaining the needed failover capacity, vOPS even has the ability to "play" what if scenarios and have the results on these before you actually do anything in real life to your environment. I will try to write one (or more) blogs post in the near future after I have taken these tools for another test run. In the mean time, the question remains. Or if your company can't or does not want to invest a considerable amount of money in one of these tools, and believe me they are pricey (but what they provide on useful information sure makes up for their price). How many VMs can I add to my current environment keeping in account the needed (or requested) failover capacity ? For me a alternate way of getting a idea on how many VMs I can add to a specific environment is by running a PowerCLI script that rounds up a average CPU and Memory use of the current VMs and you manually specify what the maximum CPU and Memory resource usage per cluster may be (Only for non HA clusters). On a side-note; In theory you should be able to calculate how many VMs you could add by using the HA slot size , but in real life there are to many dependencies and variables for this to be useful especially if you don't use reservations on your VMs. Anyway I am not going to write to much about HA, DRS slot sizes, reservations.... because there a other (Dutch) people that can (and actually did) write books on these topics. A must read for anyone who want's to be a better VMware admin, consultant or architect is VMware vSphere 5.1 Clustering Deepdive by Duncan Epping and Frank Denneman. So back to the quick, simple and somewhat educated guess way of getting a idea on how many VMs you can add to your environment. As said earlier I think the quickest way of getting such a result is by having a PowerCLI script get the average values of all VMs currently running and set the maximum resource usage allowed by yourself. The script I use is fairly simple and quick to run, and will give you results that you can use as a sort of guideline when you get this question and you need to answer it. By default the output is directly to the CLI, but you could also output to csv, xlsx or HTML if you want. The CLI output will look something like this. Both clusters in the screenshot above have more then enough CPU resources, but when you look at the MEM resources they both are around 10% growth allowed based on the current load and failover level. These results are from HA enabled clusters, so no manual config needed. The script uses in this case the "EffectiveCpu", "EffectiveMemory", "FailoverLevel" and "NumEffectiveHosts"from "DasConfig" to calculate the results. Almost every IT admin "knows" or at least thinks he knows what a VMware snapshot is and how to use it (in a good and sensible way) . I hope that the myth about a VMware snapshot can be used as a full backup has died all over the IT world, because that is the worst myth in VMware land. So we all know snapshots can be very helpful in day to day operations, like quickly reverting to a snapshot when a software patch or update turns out bad. It is also widely used in the process of backing up a VM, most 3rd party backup solutions use a snapshot to capture a VM in a stable state during their backup operation. But it is far less known that a snapshot can also be very difficult when there has something that went wrong with one of the snapshots of a VM. You could potentially lose a lot of data when a snapshot (delta) file becomes unusable, not to mention the loss in performance the VM has when it has one or more snapshots active. So VMware snapshot are very useful, safe and good when used in the right way ! Use them in a way that they are designed / intended for. This is very easily said and done within a small environment with only one or two VMware admins, but it becomes more prone to error when the environment is larger and or if there are more VMware admins (or other IT persons that have the permissions to create snapshots). If you look at a bigger company with a larger VMware environment, most of the time there will be separate departments for IT infrastructure, hardware and software. In a lot of cases the IT persons working in the software department will have the permissions to create (revert to and delete) snapshots, in the same cases the IT persons working in IT infrastructure department are responsible for keeping the VMware vSphere environment running and healthy. VMware has acknowledged the risk that having snapshots without knowing brings along and included a vCenter alarm function for it since vSphere version 4.X but this alarm has snapshot size (in GB) as trigger. Note that the growth of a snapshot is linked to the changes made on the VMs disks, so it is not directly linked to age of the snapshot. Also note that this particular alarm is known to be a bit unpredictable since version 5.1, please read VMware kb 1018092 for details. To keep track of snapshots in a environment where there are more persons allowed to create them then there are to manage the environment you might want to have some additional tools to do this. You could use RVtools (by Rob de Veij) and manually run this on a weekly or bi-weekly schedule, RVtools is a great tool to check your environment and have results presented in a "Excel" style. I use it a lot when I need to assess a customers VMware environment prior to the start of a project. 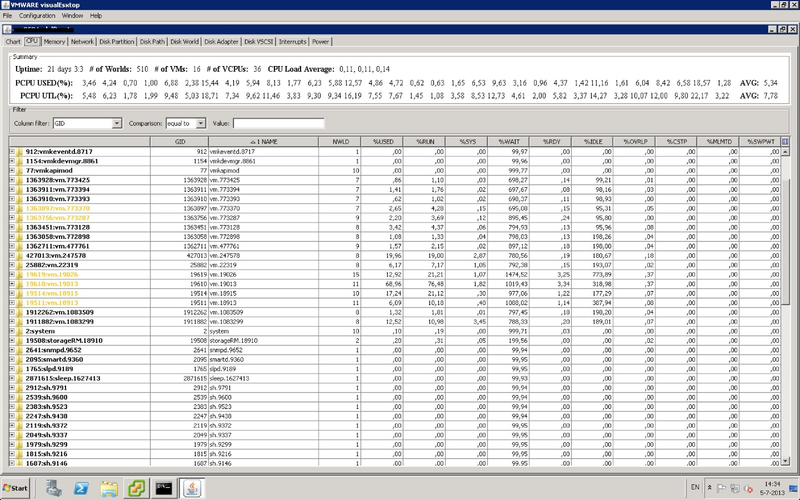 You could also use Powergui with the community powerpack which includes a script to report snapshots older then X days. But in this way it will be a manual repeating task for the VMware admins and with the results you have two options, you either contact the creator of the snapshot (if you have this information) and ask them to remove the snapshot when it is no longer needed or have them remove the snapshot directly because it is very old / very big. Or you contact the creator and ask them what you should do with those snapshots, either way you will be getting a lot of work managing the snapshots created by others. By the way the only way to know who created the snapshot (if the creator did not mentioned it in his snapshot description) is by getting the info from the vCenter event log. As a extra challenge with the introduction of vSphere 5.1 there is a possibility to Storage vMotion a VM with a active snapshot, this is good thing of course. But the downside is that when you do Storage vMotion VMs (for let's say maintenance reasons on a storage device) the process will end up consolidating all snapshots of the VMs on the target datastore, in other words the snapshots will be deleted ! So why not automate this process and have the creator receive a email message with all needed info about the snapshot that is over due (older then X days) and also receive a overview of these snapshots with creators yourself as a reminder. If the creator ignores the email and decides to keep the snapshot, he (or she) will receive the same message again on the next run. You could even create two separate triggers the first as a reminder of the snapshot and a second one more as a warning. Below you will find a PowerCLI script which retrieves the creators of the snapshots older then X days and will lookup the email address in the Active Directory. After it will send a email message to the creators each one specifying the details of the snapshot and VM it belongs to. It will also send a overview email to one account (VMware administration usually) so you can keep track of the active snapshots in your environment. With the introduction of vSphere 5.1 VMware has made some changes to going about upgrading VMtools in your VM's. Prior to version 5.1 a reboot of the guest OS was mandatory to complete a VMtools upgrade, but now that we have version 5.1 this is no long required. Keep in mind you need to run the latest VM hardware version and also run the VMtools version that goes with vSphere 5.1 to be able to do a upgrade without a reboot. 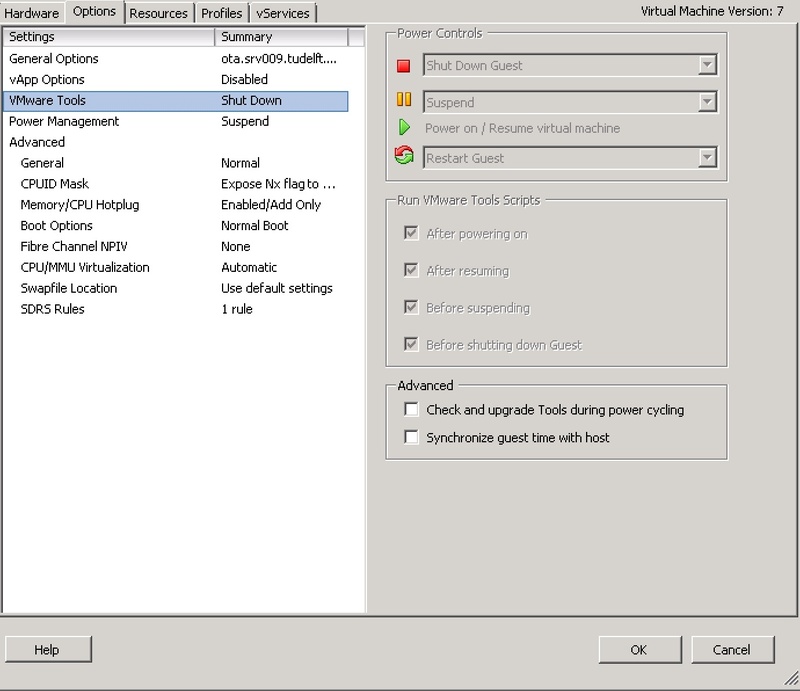 and how to make sure you run the latest version of VMtools on imported VM's or Appliances ? vSphere has VMtools options / features within the VM properties which you can set and one of them is called "Check and Upgrade Tools during power cycling" and this option has been in vSphere since at least version 4.1, but to my knowledge not used a lot. When you check this option box the VM will check and if there is a newer version of VMtools available upgrade upon every reboot. When looking and VM's with a Microsoft OS, those will need to reboot to complete their patches and updates on a regular basis. So why not enable this option in you VM's ? I find that keeping your VM's up-to-date when it comes to (security) patches important and for me VMtools is something a lot of VM admins tend to forget in this process. But if you run a large vSphere environment you don't want to go and open the properties of all VM's and to enable this feature ! That's were PowerCLI comes in handy, because you can script the enable (or disabling) of this option. You could change this script so it suites you needs, for instance you could use it to only set this option on a selected number of VM's which you gathered in a CSV file. Like in the example script below. After all changing such a small script is done a lot quicker then having to go thru all of your VM's one by one to set the option, just imagine having 1000+ VM's in your vSphere environment ! This option is still valuable in vSphere 5.1, although you don't need a reboot anymore when upgrading VMtools it is still a task that is easily forgotten. A other way of making sure you don't forget is by the use of VUM (VMware Update Manager), but this takes some time to setup a baseline and baseline groups. That is if you already have VUM installed in vCenter. VMware has released the much "needed" Update 1 yesterday. If you want all ins- and outs of the enhancements en bug fixes incorporated in this Update, please read the ESXi release notes and the vCenter release notes. Reinstallation of ESXi 5.1 does not remove the Datastore label of the local VMFS of an earlier installation. Re-installation of ESXi 5.1 with an existing local VMFS volume retains the Datastore label even after the user chooses the overwrite datastore option to overwrite the VMFS volume. 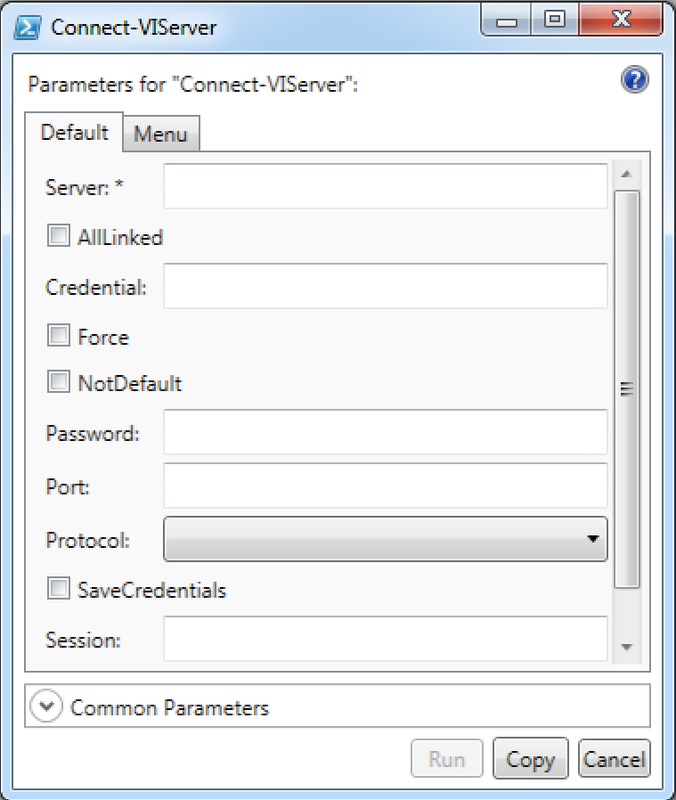 If Simple Network Management Protocol (SNMP) is unable to handle the number of SNMP trap files (.trp) in the/var/spool/snmp folder of ESXi, the host might appear as disconnected in vCenter Server. You might not be able to perform any task on the host. /var/run/vmware/f4a0dbedb2e0fd30b80f90123fbe40f8.lck for process vpxa because the inode table of its ramdisk (root) is full. There are a lot more resolved issues and enhancements, take some time to go thru both the release notes. It for sure will benefit you !